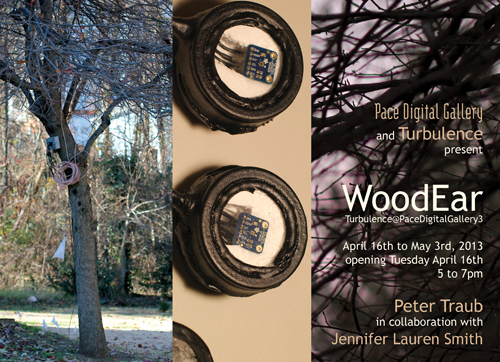 Turbulence@PaceDigitalGallery3: WoodEar by Peter Traub with Jennifer Lauren Smith :: April 16-May 3, 2013 :: Opening Reception: April 16; 5:00 – 7:00 pm :: Pace Digital Gallery, NYC. Commissioned specifically for Pace Digital Gallery WoodEar, the installation, expands into the gallery the software that launched on Turbulence.org in 2012. The work attempts to merge the dynamic qualities of the biological network of a tree — roots gathering water and nutrients; leaves using sunlight to produce food; and phloem and xylem moving water and nutrients across the structure — with the digital network of the Internet. A series of sensors attached to the tree stream data on the state of its environment — light, temperature, air pressure, and wind. This live data, merged with images and recordings of the tree’s immediate surroundings, is made audible and visible in the gallery. With public funds from the National Endowment for the Arts and the New York City Department of Cultural Affairs.